Sharp tools are paramount to use, being able to cut wood effectively. There are so many items on the market claiming this or that, it is hard to wade through the waffle and know what is what. 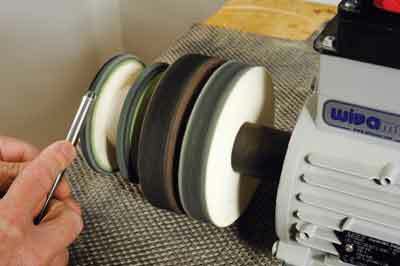 Many accept that you need to have a system - either belt or wheel - with abrasives on them to shape the bevel on a tool. Many opt to have one coarse grit and one fine grit to do this. 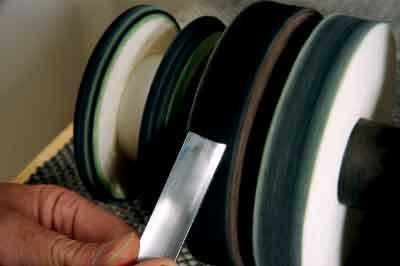 Once the edge of the blade is shaped, then the cutting edge needs to be refined or honed to a perfectly sharp edge. The two processes should not be confused. Honing can be done by hand using a strop or similar item, whereby you manipulate the carving tool across a static block faced with some micro-abrasive material. That said, people are increasingly opting to go for a powered form of honing. This typically involves the use of a powered unit onto which you attach various discs in turn. Belts or wheels of materials rotate, or run away from the user/cutting edge so there is no risk of catches during the honing process. The discs and suchlike are available shaped to allow you to refine the cutting edge on a variety of gouge profiles - hence the various shapes of wheel available. 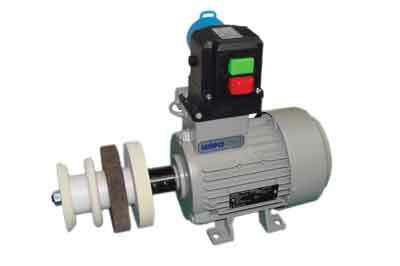 The Wivamac honing machine is, to all intents and purposes, a motor with an on/off switch on the top. Off to the left-hand side of the motor there is a spindle extension onto which are fitted four different 125mm diameter wheels. There is a 20mm soft, white flat-faced disc; a chocolate-brown flat-faced hard disc, also 20mm; a thin, 12mm-wide disc, called 'sharp', with an angled profile; and a 12mm convex radius-edged disc on the end. The kit also includes a block of polishing compound. It is worth noting that there is a European plug inlet on the switch. A fitting is supplied to fit this, but you will need to wire this up to a cable and an appropriate plug for your country to link it to an electric supply. The machine is quiet, the wheels run at 1,500rpm and the shaft runs true. If there is a slight wobble in the discs - which there wasn't - you can use abrasives to true them up. The wheels need loading up with the micro-abrasive polishing compound before use and this is a case of running the green compound onto the wheel. Once applied, you can start using the wheels. The compound will melt, turn black-grey and sink into the wheel's surface somewhat. It will need to be reapplied periodically to keep everything working well. There is no toolrest included, so you can either make one, buy one or, as I chose to do, use the machine freehand. Remember, the wheels must always run away from the cutting edge. The hard chocolate-coloured wheel has little give in the surface when a tool is placed on it. It is ideal for standard chisels and similar tools with flat surfaces to hone. The softer white wheel is ideal for gouges and similarly radiused bevel tools. The 'sharp' wheel is ideal for cleaning up the inside of 'V' tools and thin fluted gouges. The radiused wheel is used for cleaning up the inside bevels of the gouges. There is no guarding on the wheels to prevent splash or throw-off of the honing compound, so once you decide where to fit it I would advocate creating a false back wall to protect your walls and tools from spray-off. An excellent machine that is well made and simple to use. The wheels are superb and, should you prefer, you can also buy a softer cotton wheel or similar and fit that - however, there would be a lot more debris throw-off during use. The edges produced were clean and sharp; it took little time at all to create a new edge.